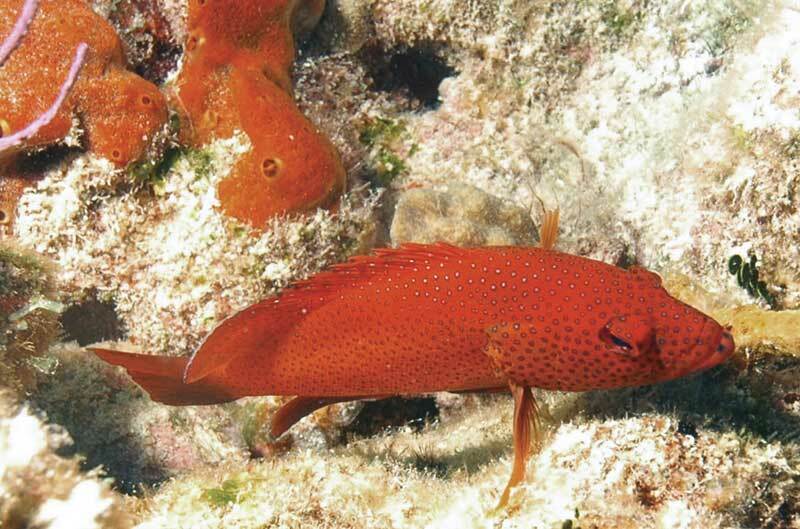 Why we love the Caribbean’s famous native fish. Granted, the grouper is not most creatively named fish in the world. The origin of this well-known and friendly type of sea bass comes from the Portuguese word for, of all things, fish (garoupa). But before you write that off as linguistic dullsville, consider the Australian alternative, “groper,” which sounds like a bloke you wouldn’t care to run into on land or by sea. Though there are close to 20 different species of groupers (or maybe we should borrow the colorful Philippino name lapu-lapu), they’re all characterized by a stout body and a large mouth—in some cases, a very large mouth, especially when parked at a “cleaning station.” Probably everyone who’s dived the TCI has enjoyed the site of a chunky grouper being groomed by a species of small fish called cleaner wrasse. At these so-called cleaner stations, bright yellow wrasses advertise their services, and larger fish regularly cruise in to have parasites and dead tissues picked from their bodies, gills and mouths. Sometimes the client does the soliciting, by resting on a small coral head, opening wide in a non-threatening manner and luring the cleaners to swim in for a routine cleaning. The smallest known grouper is the pygmy sea bass (as tiny as two and a half inches), but that’s uncommon to rare in the TCI. At the other end of the spectrum, stretching to eight feet and tipping the scales at up to 800 pounds is the aptly named goliath grouper. These smart, car–size creatures are common in South Florida and, to a lesser extent, the Bahamas and the northern Caribbean, but have actually been spotted as far north as New England and as far south as Brazil. Fun fact: It’s not a goliath but a regular old garoupa that’s featured on the back of the 100-reais Brazilian bank-note. Brazil is not alone in this distinction. The 500 Aruban guilder depicts a zwarte sproetelvis (as they call them in Dutch). People do love their groupers. 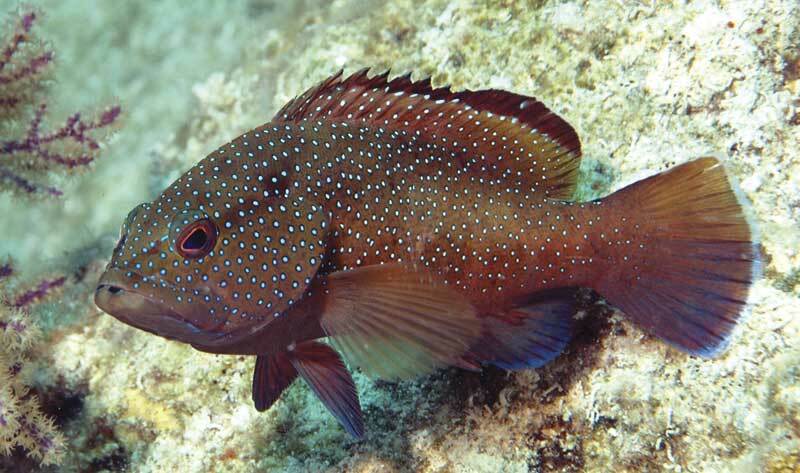 Grouper species have colorful names—literally. 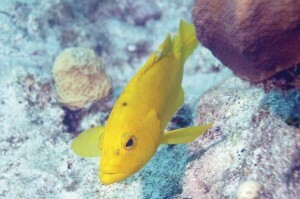 They include the yellowfin, yellowmouth and yellow-edge; there are black groupers and black sea bass; red hind, rock hind, graysby; snowy, misty, speckled and marbled. Additionally, there are groupers called Nassau, Warsaw, tiger, scamp, sand perch and of course, the BMOC, the goliath. Our friend the grouper is many things, but something he’s not is serious competition for Michael Phelps this summer in London. 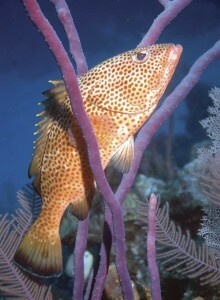 Hunting their prey is not the grouper’s primary method of getting fed. And while they don’t have a mouthful of pearly whites, they do have frighteningly heavy tooth plates inside their pharynx, the better to crush their supper. Their MO is more about hanging back than giving chase, and waiting for an unsuspecting small fish, crustacean or even octopus to come cruising by. During a recent night dive, legendary Grand Turk divemaster Smitty (Algrove) Smith of Grand Turk Diving Ltd. confessed to being somewhat spooked by a large Nassau grouper. It kept following his light and every time the light would illuminate a small fish, probably sleeping, the grouper would charge in and gulp it down! This happened time after time until Smitty finally turned off his light to end the grouper’s feeding binge. Despite this active, uh, social life, the once-abundant Nassau grouper is slowly disappearing from Caribbean reefs. Sadly, their predictable “aggregate spawning” rituals have made them targets for aggregate overfishing. Hopefully not too late, protection efforts are being made. The U.S. implemented limits in the 1990s, and in the Caribbean, some Bahamian islands and the Caymans are leading the way with long-term bans. Beyond their contribution to biodiversity and helping maintain the balance of the marine ecosystem, there’s another important reason to protect the grouper. Last year, scientists from Australia’s University of Queensland, led by Professor Peter Mumby, discovered something extraordinary about their potential role in saving other vulnerable Caribbean reef fish populations. As you may know, over the past decade, there’s been a growing scourge in the Caribbean: lionfish. Not native to these waters, they were accidently released into the ocean during Hurricane Andrew in 1992. Over the past several five years, their populations have gotten out of control because of their prolific breeding—one female can spawn a million eggs in a year—plus the fact that they have few known predators thanks to their highly venomous spines. Previous studies have discovered lionfish in the stomachs of groupers, and Professor Mumby and his team observed that lionfish populations were down tenfold in areas with large numbers of grouper. He was excited at the prospect of Caribbean groupers playing a role in stopping the lionfish invasion. This underscores the need to ramp up whatever conservation efforts are under way. “Years of over-fishing means that densities of large grouper, like the Nassau grouper, are low throughout most of the Caribbean,” he says. He has strong words of advice for those in a position to act. “If we want groupers to help us control the lionfish invasion, we’ll have to develop a taste for lionfish instead of grouper and drastically reduce the fishing of this species. Otherwise, their chronic overfishing will probably prevent natural biocontrol of lionfishes in the Caribbean.” (For more information on TCI response to lionfish, see this issue’s Green Pages. Suzanne Gerber is the Living and Learning editor for NextAvenue.org, the new PBS journalistic website for “grown-ups who are still growing.” As often as possible, but not often enough, she dives in one of her favorite places in the world, the TCI.